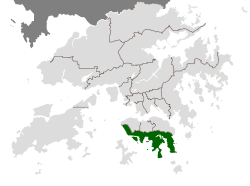 The Southern District (Chinese: 南區; Cantonese Yale: Nàahm kēui) is one of the 18 districts of Hong Kong. It is located in the southern part of Hong Kong Island. It had a population of 290,240 in 2001, the fourth-lowest in Hong Kong. The Southern District faces the South China Sea at the south, and is backed by hills and reservoirs, designated as Country Parks, at the north. The eastern half of the district is semi-rural, with some of Hong Kong's most popular beaches. The western half of the district is partly residential and partly industrial. The residents of Southern District vary from the Chinese majority to the community of expats. The eastern half containing areas such as Stanley and Repulse Bay is especially popular among expats and affluent locals because of the combination of its close proximity to Central and the wholesome environment. The western half of Southern district is more urbanized and areas such as Aberdeen containing more housing developments than the eastern half. Large private housing estates in the district include: Baguio Villa, Chi Fu Fa Yuen, Aberdeen Centre, South Horizons, Bel-Air Residence, Redhill Peninsula and Hong Kong Parkview. Cape D'Aguilar, where Cape D'Aguilar Marine Reserve is located in. 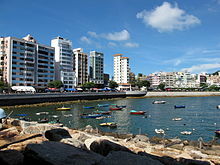 Tourist attractions within the district include Aberdeen's floating restaurants and fishing harbour; the Ocean Park; the swimming beach of Repulse Bay; The Home of Teresa Teng; the souvenir market and, formerly, the Hong Kong Maritime Museum at Stanley. It is served by Pok Fu Lam Road, Aberdeen Tunnel, Wong Nai Chung Gap Road and Tai Tam Road. The proposed MTR West Island Line and South Island Line will also be built to help serve the western half of the area. There are currently no proposed routes to Stanley or Repulse Bay due to the large number of buses that serve those destinations. ^ "2011 Population Census: Summary Results" (in English and Chinese). Census and Statistics Department, Hong Kong Government. 2011. Retrieved 11 June 2012. Wikivoyage has a travel guide for Southern Hong Kong Island. Wikimedia Commons has media related to Southern District, Hong Kong.